In tonight’s episode of Riverdale we get a bit of a “day in the life” kind of vibe as things revolve around the goings on in the paired lives of Archie and Jughead, Josie and Cheryl, and Betty and Veronica. All of them have what amounts to a crazy few days and not in a good way. First: The Black Hood has issued a warning to Riverdale. Already having cleansed the town of a few sinners, he will be watching them all for 48 hours. If he sees they are pure of heart and sinners no more, he will stop. If they fail, he will kill again. Ominous. After being rudely disturbed by his phone in the middle of cuddling with Betty, Jughead gets a call from Penny Peabody and she’s collecting on that favor Jughead owes her. It seems that FP (Jughead’s dad) got jumped while in the prison showers by a bunch of Ghoulies who want blood for Jughead (but really Archie) pulling a fast one on them at the drag race and sending their higher ups to jail. So Penny will help out FP in jail if Jughead does this one time delivery thing for her. She needs him to pick up a crate from the Southside, drop it at a warehouse in Greendale and get out before midnight because that’s not someplace you want to be after hours. Naturally, Jughead recruits Archie to help him out: he needs Archie’s father’s truck and it is Archie’s fault with the whole drag race thing. It’s a rather spooky and all together unsavory mission the two are on; car trouble, a creepy but helpful stranger turned (almost) back stabber, and a creepier duo in a warehouse are what the boys encounter on this trip. If that wasn’t perilous enough, there’s an additional creepy lady with some European accent in the warehouse who says these are to be regular deliveries and to not be late again, or else. Also, she knows Jughead’s name. Creeeeeeeeepy! If that wasn’t enough, when Jughead goes to visit his dad in the morning after the delivery, he finds his dad in perfect health: nothing wrong at all. Penny Peabody lied. Josie has a few things on her plate right now. Her mother, Mayor McCoy, moved them to the Five Seasons for safety reasons with the Black Hood being out and about, so she’s not even going “home” at night. Josie has also been busy at school during some late night hours working on solo material. Cheryl sent a producer at Shabbey Roads a video of the Pussycats singing “Milkshake” but said producer was adamant that only Josie get some studio time. No, Josie hasn’t told the rest of the Pussycats about this deal so she’s kind of going behind their backs. On top of this possible big break, she’s got a secret admirer who’s been leaving her notes and stuffed animals in her locker. Busy girl! Betty has this crazy notion that Sheriff Keller is the Black Hood. I mean, how else would the guy have gotten into the prison to kill the Sugar Man? Betty won’t relent on this idea and her suspicions deepen when Kevin reveals that his dad has been sneaking out at night, rummaging around at odd hours, not sleeping, and just acting weird. Veronica thinks he’s having an affair but Betty isn’t convinced. Veronica decides to spend the night at Kevin’s to try and sort this out herself. Betty calls during said sleepover – mainly because she’s not happy that this sleepover didn’t include her and because she wants Veronica to poke around the house. Veronica comes up empty, but finds some locked doors and a rather hot sheriff working out in the basement. She does catch him sneaking out late that night and not returning until about 4am in the morning. Betty being Betty, she’s sure he’s guilty and just can’t help herself so she breaks into the Keller house by way of the hidden key under the flowerpot. Shouldn’t a sheriff know better than that? I should mention Betty has already interviewed Sheriff Keller about how the Black Hood got into the station to kill the Sugar Man and she got some decent answers. Clearly, that wasn’t enough for her. So having picked the lock on a door with a bobby pin (because that’s a good everyday skill to have), Betty’s in the Keller house and into that secret locked room. It was basically Sheriff Keller’s own murder board in there with all the evidence and sketches and letters and such. Betty gets busted, however, and Keller shows her his logbook just to put her mind at ease. He was occupied during all of the murders with something or another. Still not convinced, Betty decides to follow him the next night with Veronica. As it turns out, Veronica was right: Sheriff Keller is having an affair…with Mayor McCoy! The Black Hood says Riverdale failed his test and the reckoning is coming. I guess it’s hard to be good when everyone is being bad. Jughead seems to be stuck as an errand boy. 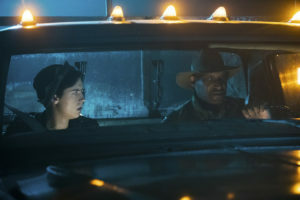 It turns out Penny has footage of Jughead and Archie making that delivery and if he doesn’t do what she says, she’s turning it over to the Sheriff. 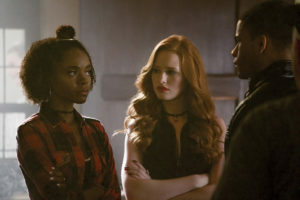 Turns out FP made her a promise and didn’t deliver, so his debt is now Jughead’s. What a bummer. Archie is really worried that Jughead won’t be able to escape his ultimate fate of jail and wants him to find a way out. Jughead wants that, too, but is living life minute by minute right now. So sad. Apparently, there once was a Riverdale Reaper. No one knows what happened to him. Could he be the Black Hood come back again? Josie’s new tunes are catchy. I dig. But I don’t dig that she had a nightmare where her throat was slashed by the Black Hood.